Washington (CNN) It is a trend that has US Navy officials scratching their heads. Between January 2016 and August 2017, US warships consistently encountered armed Iranian “fast attack” boats and drones in the Persian Gulf as the two sides routinely accused each other of behaving provocatively. But after nearly two years of regular “unsafe” or “unprofessional” interactions, the two sides have operated without incident for more than five months — a sudden shift the US Navy is welcoming with cautious optimism. “We are not going to speculate on the reason for this recent positive trend in interactions, though we hope it will continue in the future,” Navy spokesperson Lt. Chloe J. Morgan, a spokesperson for US Naval Forces Central Command, told CNN in a statement. “While we consider the decreased incidents in the second half of 2017 to be a positive development, the United States Navy remains vigilant as we continue to operate,” the statement said. The Wall Street Journal was first to report the story. In total, there were 14 unsafe and unprofessional interactions in 2017 and 36 in 2016 — an average of 2.5 such encounters per month over that time period, according to Morgan. The last incident occurred on August 14, 2017 when an Iranian drone flew in an “unsafe and unprofessional manner” close to a US aircraft carrier in the central Persian Gulf, according to the US Navy. During that encounter, a QOM-1 drone came within 1,000 feet of US aircraft flying near the USS Nimitz, prompting the US Navy to use an emergency radio frequency in an attempt to call Iranian ground units. 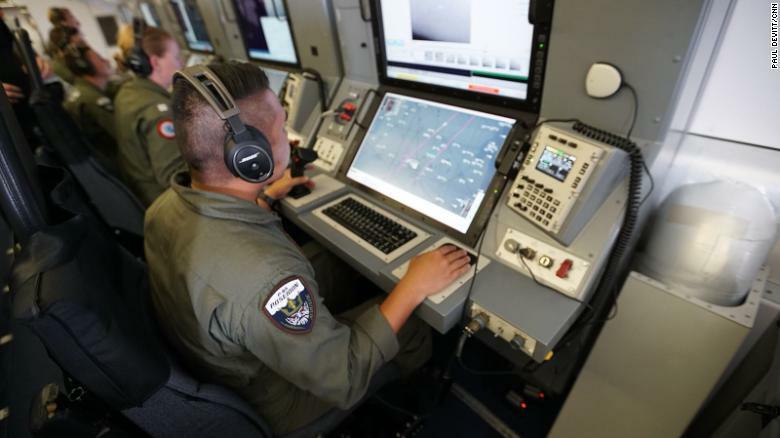 A US defense official told CNN at the time that the US deemed the drone’s behavior unsafe because it did not have any aircraft navigation lights on — an issue that remains a concern for the Navy despite the recent decrease in interactions. 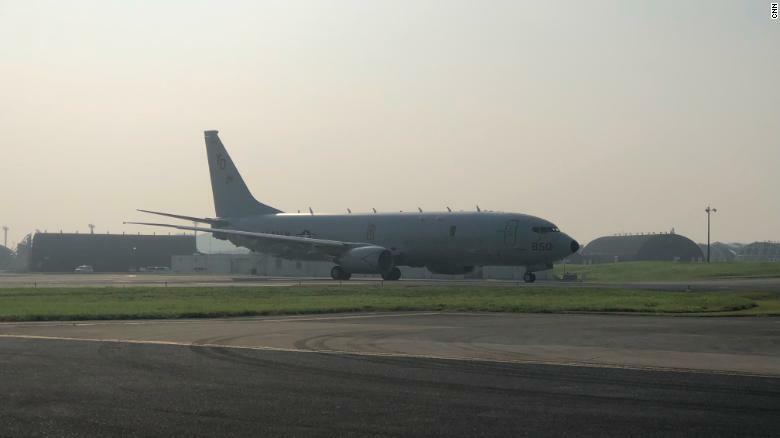 “Even with the decreased incidents, we remain concerned with the increased number of Iranian UAVs operating in international airspace at night without navigation lights or an active transponder as would be expected according to international norms,” Morgan said. CNN was first to report one notably tense encounter in August 2017 when a US Navy patrol craft fired three warning shots at an Iranian Revolutionary Guard Corps boat after US officials said it had harassed that patrol craft. 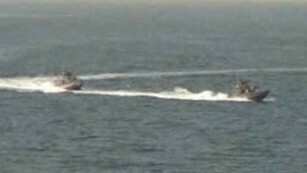 At one point, the Iranian boat came within 200 yards of one of the US Navy boats. 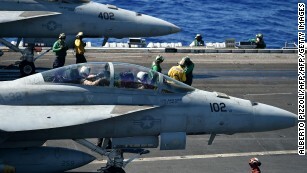 When it failed to leave the area after the Navy had fired flares and had a radio conversation with the Iranian crew, the US officials said, the USS Squall fired three warning shots. 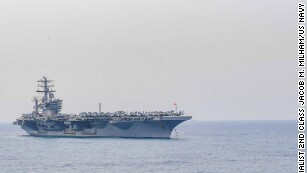 Following standard maritime procedures, the Navy fired the three shots into the water to ensure the Iranians understood they needed to leave the immediate area. A similar incident occurred in July 2017 when a US Navy ship fired warning shots at an armed Iranian patrol boat in the northern end of the Persian Gulf, two US defense officials told CNN at the time. 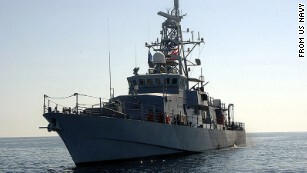 An Iranian boat believed to be operated by the Iranian Revolutionary Guard Corps, approached and came within 150 yards of the USS Thunderbolt, a US Navy patrol ship, officials said. The USS Thunderbolt was accompanied by the USS Vella Gulf, which is a Ticonderoga-class guided missile cruiser, and two US Coast Guard vessels at the time. When the Iranians did not respond to any US warnings, the Navy ship then fired warning shots into the water over concerns about the possibility of a collision, one of the officials said. 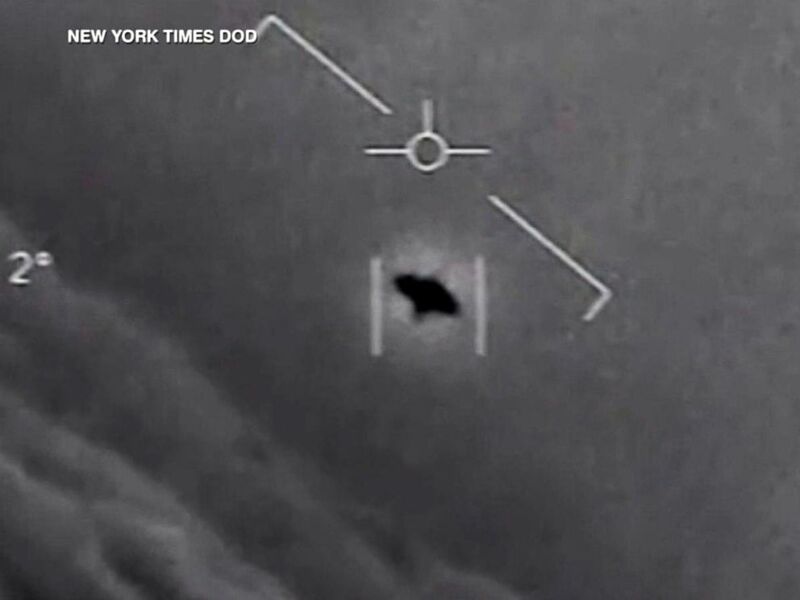 An unidentified flying object shown in a photo first obtained by the New York Times. 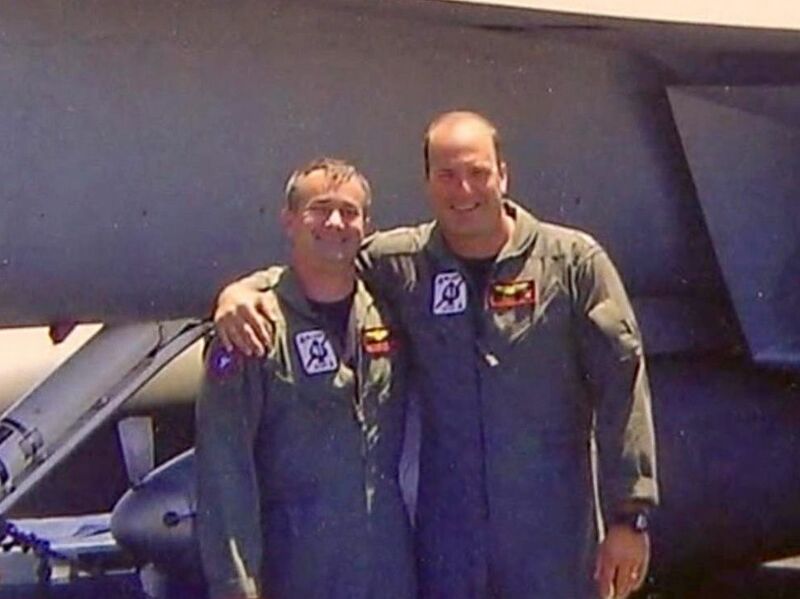 Former Navy Commander David Fravor told ABC News about his encounter with what he believed was a UFO. Fravor said there is no rational explanation for what they saw that day. There was no further investigation into the incident, he said. Beijing has long campaigned for a “dual-track approach” in which the United States would halt military drills in the region while North Korea would freeze its weapons programmes. China denied Thursday that it has abandoned its long-standing proposal to ease the North Korean nuclear crisis after US President Donald Trump suggested Beijing had agreed to drop the policy. But Trump suggested Wednesday following his five-nation trip to Asia, which included meetings with President Xi Jinping in Beijing, that the Chinese leader had ditched the plan. But Chinese foreign ministry spokesman Geng Shuang said Beijing’s position on the nuclear issue remained “consistent and clear-cut”. “We think that under the current circumstances, the suspension for suspension initiative is the most realistic, feasible, fair and reasonable plan,” Geng told a news briefing when asked about Trump’s comment. “It can not only ease the current tense situation but also solve the most pressing security concerns for all parties, provide opportunities and create conditions for resuming peace talks and find a breakthrough to get out of the stalemate,” he said. “We hope all relevant parties can have an earnest approach and give a positive consideration to the good faith of the Chinese side,” Geng said, adding that using military force was “not an option” to resolve the crisis. Xi is sending a special envoy, Song Tao, to North Korea on Friday. Although Song’s mission is officially to brief North Korea about China’s recent Communist Party congress, analysts say he will likely discuss the nuclear issue. Two American women and their dogs were rescued this week by the United States Navy, after being adrift in the Pacific Ocean for five months. Their engine had failed while attempting to sail from Hawaii to Tahiti. The women endured two separate shark attacks, with their boat surrounded at one point by seven sharks slapping their tails against the hull, they told reporters Thursday night on a conference call, in remarks reported by ABC News, The Guardian and other news outlets. “We thought it was lights out, and they were horrific,” one of the mariners, Jennifer Appel, said of the shark attacks after being rescued Wednesday. They also said they survived two major storms, the first of which lasted for two days, with 25-foot waves and hurricane force winds flooding the boat’s engine leaving the two of them to rely on the boat’s sail alone for the next five months. They had packed enough dried food for a year, but had another close call when Appel fixed their broken water purifier with only a gallon of clean water left on the boat. Appel, an experienced sailor, was accompanied on the trip by her friend Natasha Fuiava, a sailing novice, and their dogs, Valentine and Zeus. The women, both from Honolulu, Hawaii, were spotted 900 miles south-east of Japan by a Taiwanese fishing vessel, which alerted Guam’s coastguard. 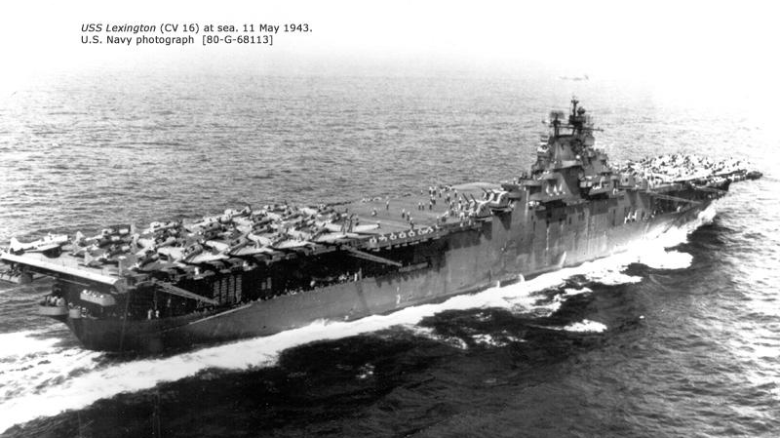 The Navy said the women had received medical attention and would remain on the USS Ashland until its next port of call. “The U.S. Navy is postured to assist any distressed mariner of any nationality during any type of situation,” Commander Steven Wasson, the Ashland’s commanding officer, said in a statement. The USS Fitzgerald was involved in a collision with a merchant vessel while operating off the coast of Japan and there have been injuries, according to a statement Friday from the U.S. military. The Japanese Coast Guard has arrived on the scene, about 56 nautical miles southwest of Yokosuka, Japan. Live footage shot from a helicopter Saturday morning by Japanese broadcaster NHK showed heavy damage to the mid-right side of the Navy ship, which appeared to be stationary in the water. People were standing on various parts of the deck. The collision occured at approximately 2:30 a.m. local time on June 17. Three compartments aboard the guided-missile destroyer are flooded, according to a Pentagon official. “There is no danger of the ship sinking,” one official told Fox News. home to a US Navy base. Fitzgerald, a guided-missile destroyer, carries Tomahawk cruise missiles and missiles capable of shooting down ballistic missiles, part of the regions ballistic missile defense program.